No starter packages available at the present. Due to the interest of many of the people contacting us to find family milk cows who are A2A2 for Beta- Casien, we will be testing cattle offered here through the UC Davis Veterinary Genetics Lab and will post the results for the animals being offered for sale. We will also post bull information if known for cattle sold bred. Kitten tested A2A2 through the UC Davis Genetic Lab. She was born 5-14-13. Gentle she can be milked by hand or machine. 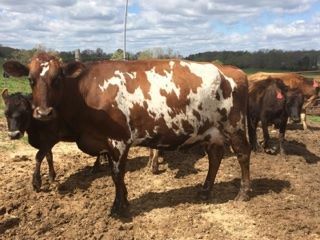 She was bred on 11-16-18 to Select Sires A2A2 Jersey Sire 14J568 and due in late August. She is presently milking around four gallons/day. 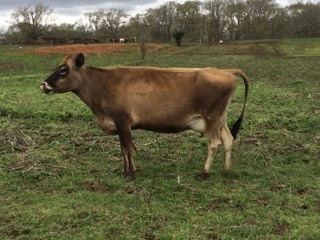 Asking: $1,800.00 for this A2A2 pure bred Jersey milk cow. Magnolia was born 7-23-14 and is a purebred Jersey. She has been confirmed A2A2 by UC Davis Genetic Vet Lab. Magnolia is very gentle and easy to handle. 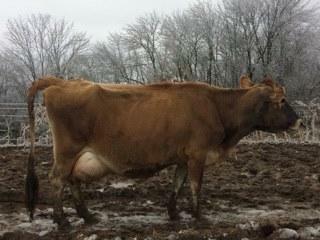 She should make a wonderful family milk cow and can be hand or machine milked. Presently milking around 4 to 5 gallons/day. She was bred on 3-20-19 AI to a Select Sires Angus bull. Asking: $2000.00 for this nice young cow. 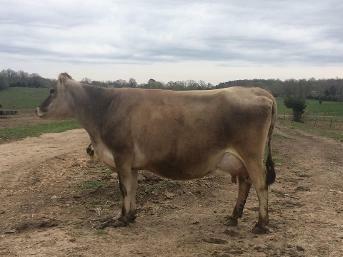 Ariel is a registered pure bred Jersey and will make a fantastic gentle family milk cow. 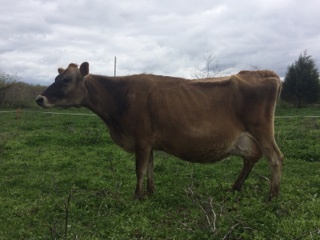 Though she was born in 2006 she is still a wonderful producer, freshening on Feb. 7th of 2019 and is currently milking around 8 gallons/day. Ariel can be milked by hand or by machine and is very easy to handle. Asking: $650.00 for this great family milk cow.